This species inhabits most of the southern two thirds of the Baja California Peninsula. It is also found on a number of the islands in the Gulf of California including San Marcos, Carmen, San Jose, San Francisco, Partida del Sur, Espiritu Santo, and Cerralvo. It is seen on one island on the west coast, Isla Santa Margarita. The eyes and rattle of this species are proportionally large while the head is incredibly small and narrow. It has a slightly raised scale above the eyes but not as pronounced as the horn-like scales above the Sidewinder Rattlesnake's eyes. 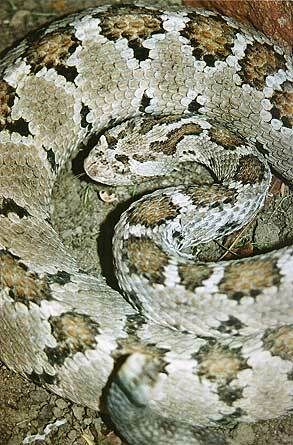 This rattlesnake is often seen in rocky areas among cacti and thornscrub vegetation.